For over half a century, Cloverleaf Ranch has provided a healthy, wholesome and fun vacation for children. Originally a boys working ranch, Cloverleaf has become a “home away from home for thousands of children and adults from all over the world. 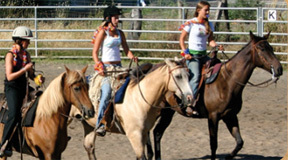 Today, in addition to their award-winning horse boarding and riding programs, Cloverleaf is home to Sonoma County’s only Western Summer Camp Program. The Ranch provides the fun and excitement of the western frontier to participants, with activities such as horseback riding, campouts, hiking, swimming, ropes course, arts and crafts, and many more great activities. The 160-acre ranch provides one of the most scenic trail rides in Northern California. If you’re searching for the opportunity to spend time with that special someone in an unforgettable setting, try a romantic tour for two, riding the trail, afterwards enjoying appetizers and drinks by the pool. Or you may choose to pause along the trail and savor a picnic under a beautiful old oak tree overlooking breathtaking views of Sonoma County. Ask for the affordable “Sweetheart Silver Spurs Package. Or for the younger wrangler, ask about the Buckaroo Clinic. It includes horseback riding, crafts, games and snacks. Cloverleaf Ranch also offers a one of a kind experience for corporate events and private groups. Enjoy horseback riding, archery, a complete sports program including basketball, batting cages, riflery, a beautiful swimming pool, challenge course, zip line and many more available options. Perfect for team building! They are located just off Highway 101 at the northern edge of Santa Rosa, only an hour drive from San Francisco.